Mike Stroud and Evan Mast (aka Ratatat) first met as students at Skidmore College and they started workind together in 2001, when they recorded several songs under the name “Cherry”. Their 2004 debut, Ratatat, was written and recorded in Mast’s Brooklyn apartment on Stroud’s computer. This first effort is a collection of ten entirely instrumental tracks, with the exception of vocal excerpts at the beginning and end of selected tracks. 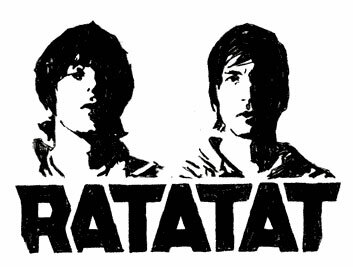 In August 2006, Ratatat released a second album Classics, followed by LP3 in 2008. Between releases, Ratatat found time to tour with artists such as Björk, Daft Punk, Mouse on Mars, Interpol, Franz Ferdinand, CSS, The Faint, Super Furry Animals, Clinic, Panther and The Killers. I like the german beginning of “drugs”. Yess go Ratatat 🙂 I stream them all the time.